One of Jøtul’s most popular and most imitated woodstove is back! Winner of the 2005 Vesta Design & Technology award, the Jøtul F 118 CB Black Bear combines the simple elegance and utility of the original Jøtul 118, with modern solid fuel combustion technology. 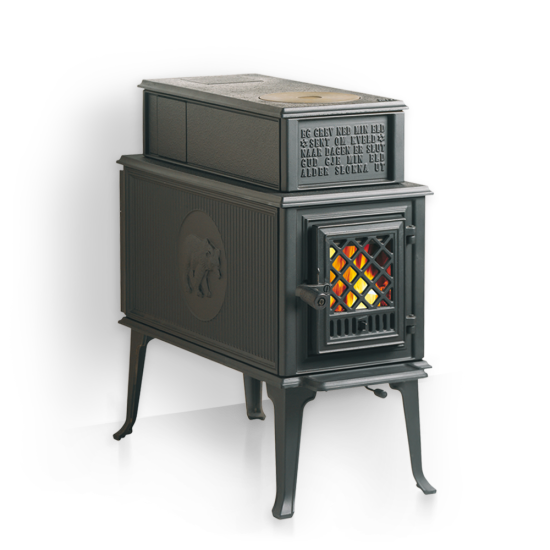 Incorporating Jøtul’s new Crossflow™ non-catalytic secondary combustion system and our legendary front-to-back “cigar burn,” this stove is the pinnacle of clean burn efficiency and maximum burn time.Holding strong to its Norwegian roots, the Jøtul F 118 CB Black Bear still features the decorative front plate that translates as follows: “I built me a flame late one night. When day is done, God will my flame never die.” Popular options include: screen for open door fire viewing, fresh air kit, and rear and side heat shields.